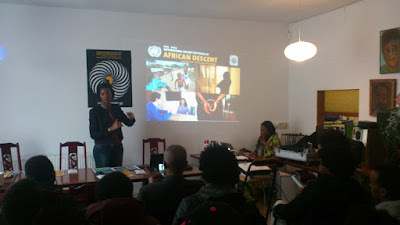 On March 5th 2016 cagintua invited politicians, African political migrants and political refugees to Infocafe "Der Winkel" in Bad Belzig. Bad governance and corruption are mostly blamed for poverty in Africa. How can African political refugees gain more politcal experience and support in a country like Germany? Can political training of African migrants and refugees contribute to a democratic development in Africa? In which way could the African governments benefit from the political experience of refugees and Africans in Diaspora? Much has been said about the causes of corruption in Africa. Corruption and bad governance are some of the reasons why many young people from Africa flee to Germany and other parts of Europe. Some African migrants return to the continent to take part in politics and governance, this has not changed the situation. Bad governance and corruption are still considered as challenges facing democracy in many African countries. This seminar was to examine how African politicians, African political migrants and refugees can benefit from the German political training. In which way can such training be beneficial to African political development? Can political education of African politicians and political refugees have any impact in combating corruption in Africa? In which way can the political training of African politicians and African migrants contribute to political development in Africa? This seminar was for politicians, African political migrants and political refugees.